Lo ModA's minimal art school dropout sound is a confident and laudably new idea derived from a myriad of 90s era Baltimore Dischord-ish projects, including Candy Machine and Fascist Fascist. 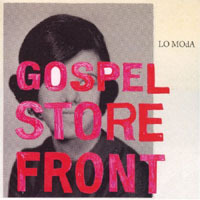 Cool bands, both, but with Lo ModA's (sic, sorta) debut album, Gospel Store Front, we meet a band that's grown away from any very easily identified genre roots and created a very natural sound that they own outright. It's a slinky, mean, great album. Of course with a name that translates to "The Fashion," it's hard not to receive some of the invention (wide use of strings, subtle percussion and stripped down production) as more (mere) aesthetic polemic. But they're very direct and catchy and they earnestly address our culture in a way that ties them to their dissident punk roots and rescues the album from being too precious. It's been receiving a fair amount of airplay here at WFMU recently. They've agreed to let us share a few tracks from Gospel Store Front and they send word that they're putting out a new album soon. Bravo, Marcus! Everything I've checked out from this album has sounded 100% top shelf. I definitely like the "artschool dropout" description, and would add that they also invoke some weird elements of that weirdo British band Half Man, Half Biscuit.